Are you looking for a live session with valuable content on authentic speaking, selling or influencing for a group of independent professionals or service based entrepreneurs? 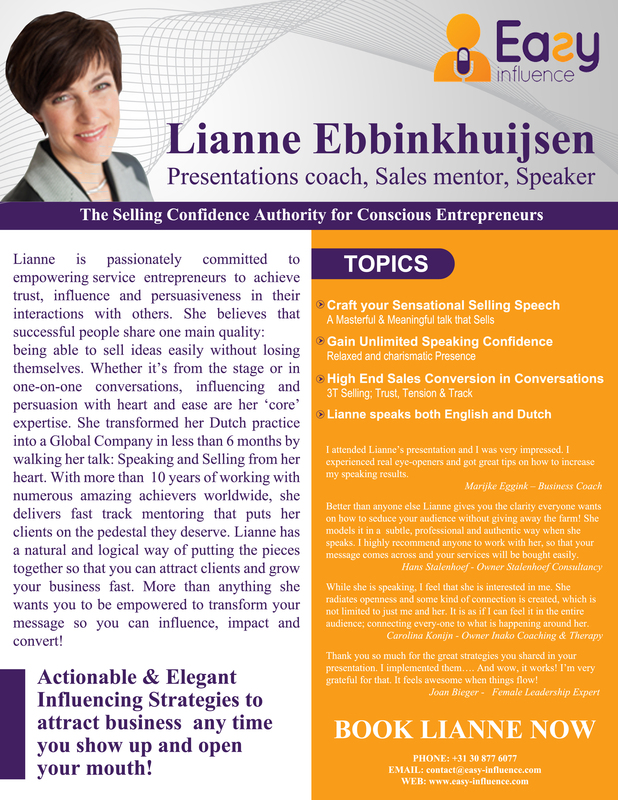 Lianne will be more than happy to speak at your event or gathering. She speaks in both Dutch and English. ‘Inspiring, professional and impressive’, these are typically the qualifications Lianne gets back from her audience. In her early career, Lianne was a pretty lousy speaker. The frustration of not being able to speak has been replaced by the ability to speak in front of groups with joy, ease and results. The complete inability to close a deal has changed into flooding sales. Her learning curve offers so much value for other independent professionals and entrepreneurs who themselves would like to get their word out and sell their ideas, without giving themselves away! Want to talk about having Lianne speak at one of your events, meetings or teleseminars? Contact us here! I attended Lianne’s presentation and I was very impressed. I experienced real eye-openers and got great tips on how to increase my results out of speaking. I realized that speaking is a major marketing tool and that I offer tremendous value when I speak. Every member in my audience can be a potential client so it is essential that I can motivate my audience to take action and have them step up towards me and my work. Lianne showed me how to do that. Almost all of my clients that enrolled in my programs in the last 6 months came through my speaking. Thank you so much for the great tips you shared in your presentation. I implemented them…. And wow, it works! It feels awesome when things flow! You show how to make people hungry for more! Your story was incredibly good. It convinced me! I was afraid that my own presentation had to be a sales pitch. that will make the listeners hungry for more. Better than anyone else Lianne gives you the clarity every-one wants on how to seduce your audience without giving away the store! She models it in a subtle, professional and authentic way when she speaks. I highly recommend any one who gives presentations to work with her so that your messages comes across and your services will be bought easily. Not one single Apple iPhone has been sold in the entire world. An iPhone is bought. Lianne makes sure your services will be bought! While she is speaking, I feel that she is interested in me. She radiates openness and some kind of connection is created. This is not limited to just me and her. It is as if I can feel it in the entire audience, connecting the entire group with what is happening around her. Are you interested in having Lianne speak at one of your events, meetings or teleseminars? Please contact us and we’ll discuss if and how a speaking engagement fits your needs and wants.